The Sun is known for being Britain’s biggest newspaper and its bingo site hopes to become the biggest in Britain as well. In this Sun Bingo review, we’ll rate the different features of the site so you can see whether it’s worth signing up. When you sign up to Sun Bingo as a new member, you’ll be able to claim a 300% match bonus. To do this, you need to deposit at least £10 and wager a total of £10 in cash on bingo tickets and enter SUNMAX promo code. Once you’ve done this, you’ll receive £20 in bonus money to use on bingo games and £10 in bonus money to use on any other games. The bonus money does come with wagering requirements: the bingo money has to be wagered three times and the other games money 30 times before you can make can withdrawals. The offer is quite good, though it’s a bit restrictive in that you have to wager the £40 bonus money on two different types of games to meet the wagering requirements. Most of the site’s bingo games are 90-ball bingo games, though there are a few others available, such as 75-ball and 80-ball bingo. There’s the Learner Room that’s available for players who have been members for a week or less. This room offers four hours of free bingo every day. 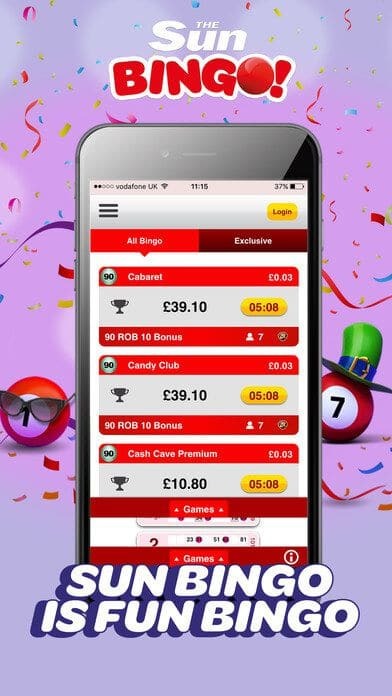 Some of the 90-ball bingo games have special features: for example, there’s 1TG and 2TG games that have prizes for players with one or two numbers to go when house is called. The bingo lobby is well organised, with the rooms sorted by what type of bingo they have (e.g. 90-ball, 75-ball) and sorted again into what range of prices the tickets are. Best of all, there are even free bingo games waiting to be played. Aside from bingo there are plenty of other games available at Sun Bingo to give players a bit of variety. 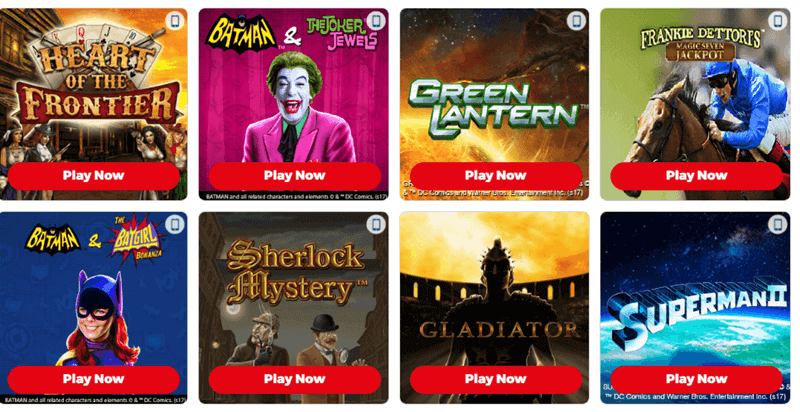 There’s a decent number of slots available, some of which have progressive jackpots. You’ll also find a few table games and scratch cards available to play. There are plenty of promotions running at Sun Bingo. In fact, there are more than 20 regular ones to take advantage of. Some of the many special offers include free bingo games with cash prizes, paid bingo games with thousands of pounds to be won, sometimes tens of thousands, and buy one get one free bingo, which you can play several times a day. There are also match bonuses you can claim for your second and third deposits. 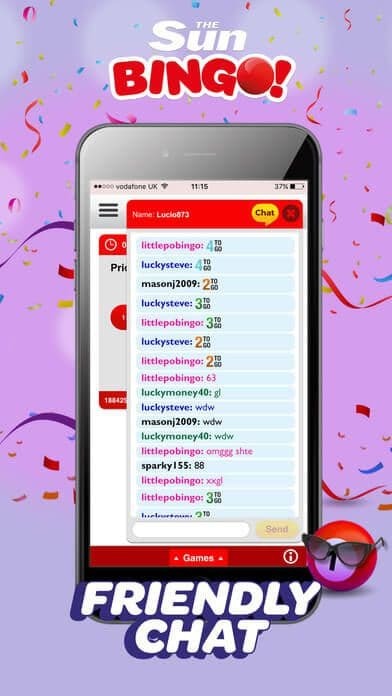 If that’s not enough, there’s also a good selection of chat games offering cash prizes for the lucky winners. Most of the promotions seem to be centred on getting players to join in regular bingo games with significant cash prizes. Sun Bingo does have a VIP scheme and it has four levels to it: Bronze, Silver, Gold and Platinum. 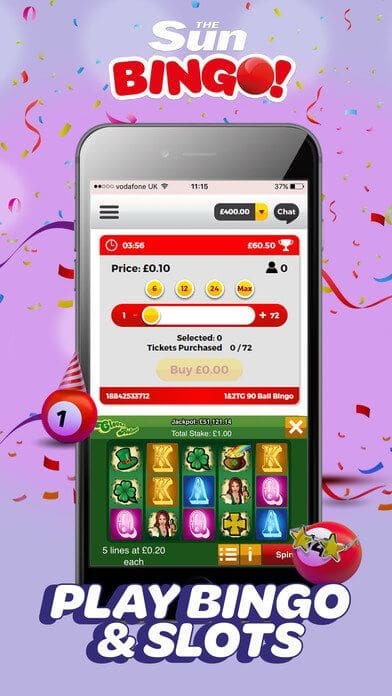 The VIP scheme offers loyal players plenty of exciting rewards and benefits, such as reload bonuses, cashback, exclusive VIP bingo games, birthday bonuses and gifts and more. There is a Sun Bingo app available for iOS devices only. The app has plenty of games and promotions, as well as a good customer support service. It’s easy to navigate and not too cluttered, with everything easy to find. The app is great for those who want to play bingo and other games while on the go, as it offers pretty much everything a good bingo app should. Given that Sun Bingo was developed by the UK’s biggest newspaper, it’s no surprise that the site’s community is pretty big and active. The bingo rooms do tend to attract a fair number of players and generally speaking, players are quite friendly and welcoming. The chat hosts do a good job of keeping things exciting and fun for all players, including newbies. Plus, they’re very helpful and won’t hesitate to answer your questions. To help newbies get acquainted, there are several tabs in the Community section such as Chat Hosts, offering introductions to the chat hosts, Chat Lingo, where you can learn bingo lingo, and Chat Guidelines, where you can learn the dos and don’t of bingo room chat. As well as all this, Sun Bingo is active on Facebook and Twitter. Following Sun Bingo on social media is a good way of keeping up to date with the latest promotions and bonus offerings. Sun Bingo accepts a good range of payment methods, including some of the most commonly used ones. There don’t seem to be any fees charged by Sun Bingo, but bear in mind that when making transactions with Sun Bingo that your payment provider may impose additional fees. Withdrawal times are quite fast. Withdrawals usually take a few days to reach you, but they may take up to a week. The minimum withdrawal amount is £10 for all payment methods. Sun Bingo’s contact options are quite good, though some bingo sites have customer service available for longer hours each day. You should expect to receive a response straight away if you’re using live chat or phoning the customer service team, though there may be a short wait if using email. The customer service does seem to be quite helpful. The F.A.Q. section has answers to lots of commonly asked questions, so many players might not even need to use customer service. Overall the Sun Bingo website is definitely worth checking out if you’re keen to play bingo online. As one of the UK’s biggest bingo sites, it’s got an impressive amount of content, including a very generous number of promotional offers. There’s plenty of bingo to be played here with several types available. Newbies are made to feel very welcome and there’s enough games for players of all experience and skill levels. The site is very popular – and for good reason. No matter what your tastes, you’re bound to have an enjoyable and memorable experience playing at Sun Bingo. So sign up, deposit £10, wager £10 on bingo tickets and claim your welcome bonus today!